When using a Shark 13” Sweeper you will be amazed by its capacity of picking up debris situated right next to the walls. The sweeper has an integrated squeegee that helps collect all the crumbs, hair and debris that usually get pushed against the walls with other machines. This model, on the contrary, picks up everything, leaving all surfaces mess-free, and evenly cleaned. While its motorized brush picks up large and small pieces pretty effectively by throwing them into the dust cup, the fact that the Shark 13” Sweeper has no suction feature may be a drawback for those of you who want a deep-cleaning tool. The brush will pick up pieces that are large enough to be supported by two bristles, but a smaller particle will just slip through. To ensure you have a properly cleaned carpet, a vacuum cleaning will be needed. 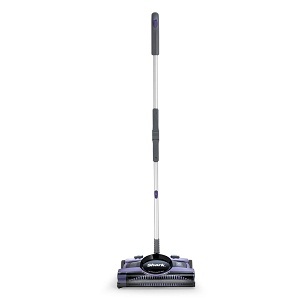 The Shark 13” Cordless Sweeper is highly efficient in cleaning both carpets and bare-floor surfaces. The 13-inch brush gives a big enough swipe to reduce the time you spend cleaning and also saves power. 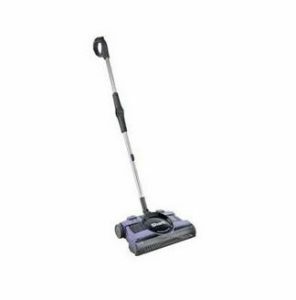 What’s more, this sweeper has two available speeds, which allows you to adjust the power of the motor to the specificity of the surface you’re cleaning. The swivel system lets the head move as you go around bodies of furniture, absolving you from the pulling and lifting usually consistent with this activity. While electric sweepers, brooms and vacuums almost always have you second their use with a manual broom or brush, the Shark 13” has such a low profile that it can easily go under the furniture to grab all the scattered debris. Furthermore, once your dust cup is full, all you have to do is place the head of the sweeper above the trash bin and release the dust without having to manually remove it. This is extremely helpful, as it gives the process a time-reducing flow. For close-range cleaning and higher surfaces, simply detach the handle and use it with confidence. With no suction process, the Shark 13” Sweeper only has a 7.2V motor to spin the brush. This makes the process sound resemble rather a purr than a motorized machine buzzing. The low noise feature lets you use it anytime without bothering the neighbours or waking up your spouse or your children. In addition, once you’re done with the sweeping, just fold the handle and place it in the broom closet, out of everyone’s way. One of the features that most of the reviewers insisted on is the lightweight of this item. Not only that you can pick it up and carry it along your floor with one hand, but you can let your kids do it, for it won’t make their arms sore even after its 55-minutes runtime. Plus, with no cord to plug and unplug, and the quick, no-touch dust release, this sweeper saves you any unnecessary effort and makes you feel as if you’re simply strolling.